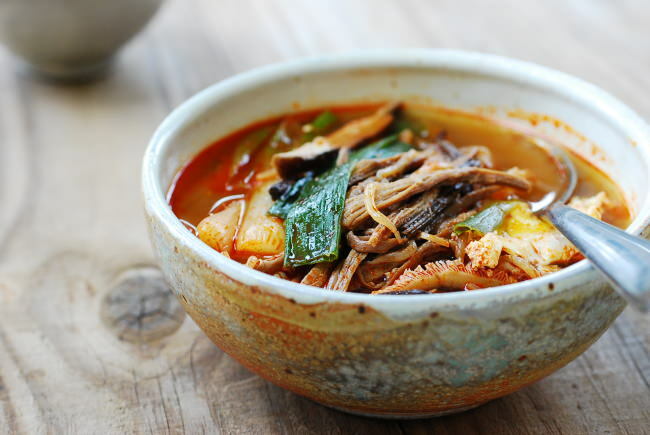 Yukgaejang (육개장) is a hearty, spicy beef soup that’s highly popular in Korea. 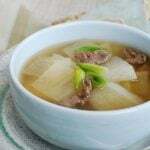 Made with shredded beef, lots of scallions and other vegetables such as gosari (fernbrake fiddleheads), beansprouts, and mushrooms, this is a substantial soup that has great depth of flavor. You won’t need anything other than a bowl of rice for a completely satisfying meal on a cold winter day. 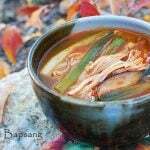 In Korea, yukgaejang is also popular as nourishing soup that helps fight the summer heat. 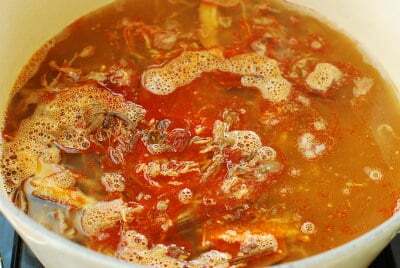 Beef brisket is the best cut for this soup. It’s a flavorful, tough cut of meat that is great for making broth, and it delivers pull-apart tender meat which is ideal for this soup. You can also use flank steak or shank meat. 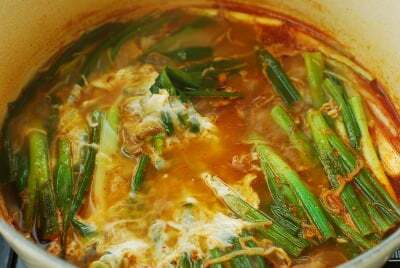 If chicken is used instead, the soup is then called dakgaejang (닭개장). 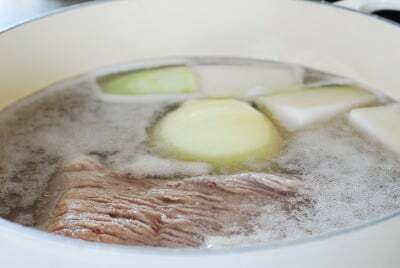 There are other similar beef soups in Korea, but gosari (fernbrake fiddleheads) is unique in this soup. 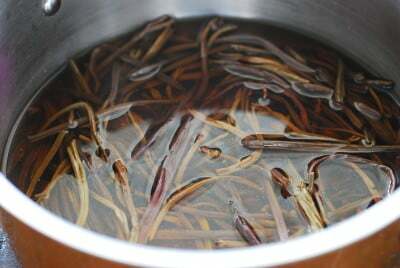 You can buy dried gosari (고사리) at any Korean market and rehydrate by a combination of soaking and boiling in water. Look for the ones with short, thin stems. 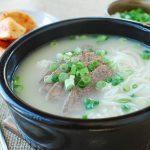 Besides adding soft, chewy texture to the dish, gosari imparts a deep, earthy flavor to the soup. 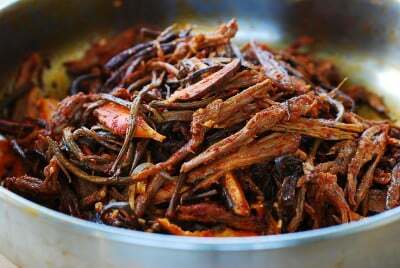 A bag of dried gosari can last for a long time in your pantry, and you can also use it in bibimbap (비빔밥). Sesame oil is essential, and it’s typically infused with gochugaru (Korean red chili pepper flakes). Simply heat the oil and mix with the gochugaru. 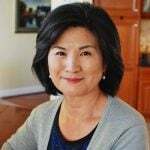 For added layers of flavor, I usually add very small amounts of gochujang (Korean red chili pepper paste) and doenjang (Korean fermented soybean paste). 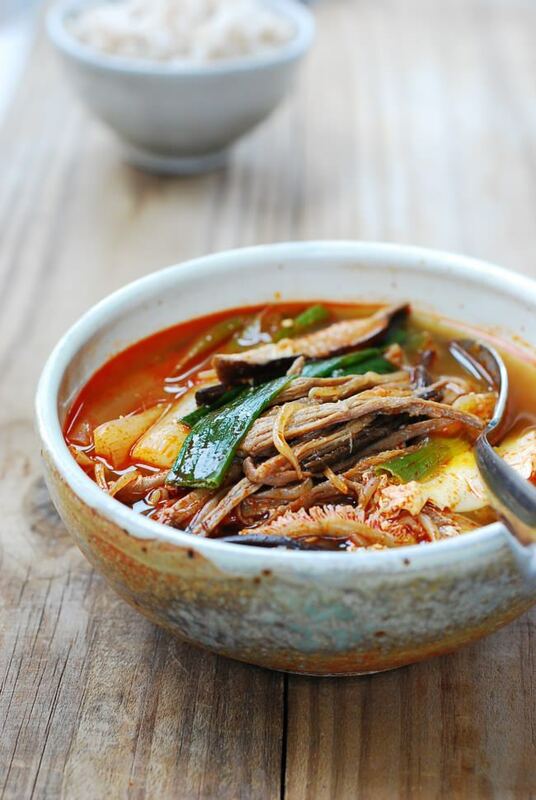 This yukgaejang recipe is not fiery hot. Adjust the heat level according to your taste. 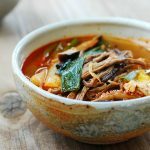 A hearty, spicy Korean beef soup packed with flavor! Add the gosari and 4 cups of water to a small pot. Boil over medium heat, covered, until tender. Mine only took about 30 minutes, but the time can vary significantly depending on gosari. Turn the heat off and let it cool in the cooking water. When ready to use, rinse in cold water and drain. Cut into 4-inch lengths, removing tough ends of the stems, if any. In a large pot, bring the meat, onion, optional radish, and garlic to a boil in 14 cups of water. Reduce the heat to medium, and skim off the scum. Boil, covered, until the meat is tender enough for shredding, 1 to 1-1/2 hours. Pull a string of meat off and check the tenderness. Remove the meat and cool. Discard the vegetables, reserving the stock in the pot. Spoon off any visible fat. 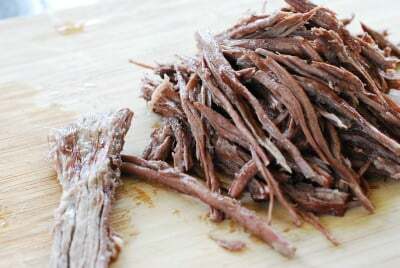 When the meat is cool enough to handle, shred into about 3 to 4-inch strips. 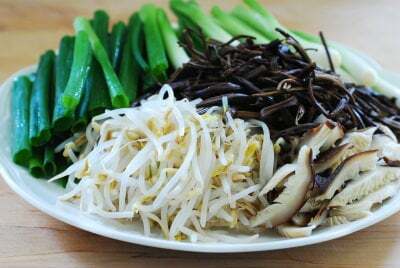 Blanch the bean sprouts in boiling water for a minute. Wash with cold water and drain. Cut the scallions into 4-inch lengths. Thinly slice the soaked mushrooms. In a pan, heat the sesame oil until hot over low heat and stir in the chili pepper flakes. Turn the heat off as soon as the oil starts to turn red and the chili pepper flakes become a bit pasty. This only takes a few seconds. Do not burn the flakes. Add the meat, fernbrakes, mushrooms, 1 tablespoon soup soy sauce, and garlic. Combine well. Add the meat and gosari mixture along with 1 tablespoon of soup soy sauce into the broth. Stir in the gochujang and doenjang and boil over medium heat, covered, for 20 minutes. Throw in the bean sprouts and scallions, and boil for another 10 minutes. Add salt (1 teaspoon or more) and pepper to taste. Slowly drizzle the eggs over the boiling soup and turn the heat off. Serve with rice. 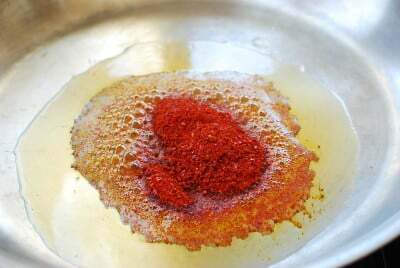 You can also soak the gosari for several hours to soften and then boil over medium heat until tender. U was wondering if using a pressure cooker would help to speed up the process without sacrificing quality? Hi Melody – So sorry for the late response. I haven’t used a pressure cooker to make this soup, but I’m sure it will help speed up the process. I’d recommend using the pressure cooker for only step 2 though. Enjoy! Hi. I have some dried gosari and would like to know how to use/season them as a side dish. I use your website ALL the time. Thank you. 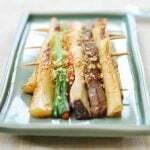 Kim – My bibimbap recipe includes a gosari side dish recipe. It’s obviously for bibimbap, but it can also be a side dish. Thank you so much for using my recipes!! That’s great to hear, Max! Hope you’re having a great holiday season with your family and friends. Thank you so much for your website. I love your recipes !!! 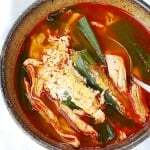 I would like to know if you are going to put a recipe about how to make 칼국수. You’re welcome, Sophie! Kalguksu is definitely on my to-do list. Stay tuned! Hi Hyosun, thank you for this recipe. I made it today n it’s a keeper. I was wondering if I can use the liquid that the 고사리 was soaking and cooking in to add to the soup stock? I’d still keep it 14 cups of water only minus and replace the 고사리 liquid however amount it measures to be. Would that make it too strong with that flavor, or bitter…? Hope my question isn’t confusing. Thanks again! Hi Young Mi – Thanks for trying the recipe out! Glad it’s a keeper for you. I think gosari soaked water would overpower the soup and make it bitter. You can use the mushroom soaked water if you want to add more flavor to the soup. Cheers! I know this is going to sound ridiculous, but I’ve substituted fresh watercress for the kosari and it turned out surprisingly good. Watercress doesn’t need to be cooked for long, so I just add it at the very end with the scallions. Hello, I love your blog! I’m making this recipe tomorrow with a friend for the first time and I’m really excited! Just one question: would you recommend adding noodles to this dish? If so, what type? Thanks for the love! Dangmyeon (Korean sweet potato starch noodles) is the best one to use. It’s the japchae noodle and also typically used for yukgaejang. Enjoy! I use my own recipe “inspired” by others and employing what I have in the cupboard and what veggies are fresh and well-priced at any given time. For example, I’ve used Napa and green cabbage, thinly sliced carrots, yellow and white onion, bell peppers, button mushrooms, kimchee, daikon radish, red radish, and bok choy. For noodles, which I always add to my soup, I have used the sweet potato starch variety, rice vermicelli, soba, and udon. All of them work well, and I find the udon noodles make a more substantial meal out of the soup. They might not be considered traditional, but they are very tasty in this application. Thank you for sharing your precious recipes. I am giong to be a good cook soon!! This one of my favourite soup my mom made for me when I was little. Thank you so much for sharing this recipe. I will make it for my mom now as she is elderly and does not remember how to. Blessings and with much gratitude. Aww that’s nice! I’m sure your mom will love it, made with daughter’s love. 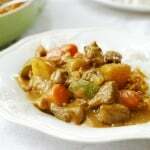 It’s my great pleasure to share recipes. Hearing stories like yours makes it very rewarding. Hi, I love your website and would love to try this recipe. I am wondering what is soup soy sauce? Is it something that is already bottled and sold at the Korean market? Oh sorry I’ve missed your question. Yes it is. Called 국간장 or 조선 간장. See my ingredients tab at the top of the page for a photo. Hi I’ve tried making yukgaejang twice now and I feel like everytime its kind of watery. I wonder what the end resulting volume of liquid should from the original 14cups of water. Whenever I go to restaurants it tastes much richer/thicker(?). One restaurant’s description of their yukgaejang was “buttery without adding butter”. Some of my friends have suggested adding a bone in to give it a bit of a seollongtang thickness? What are your thoughts? Thanks for posting the recipe!! Thank you for another great recipe. Again, very authentic. 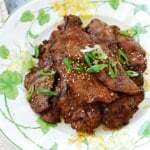 I enjoy making my own Korean food, and I found your website and have been a loyal user. This recipe tastes very similar to the restaurant, but I can save alot of money by making it myself. Plus, I can have as much as I want ! Oh thank you! Great to hear that! Happy Korean cooking!